By the stars, has it been a busy past couple of weeks or what? Summer has consumed my brain cells; I am enjoying the weather with full abandon and my normally glow-in-the-dark skin has a touch of color to it. Not to mention? Movement is a very good thing. With that, I have a few things to tell you. Hopefully they’ll retain your interest, but you never know. There’s so much to see, to read, to enjoy. . .LOOK, SQUIRREL! I wrote an article for BookLife about how you can Learn From The Stories You Hate. I strongly feel that books and stories are your text books. There’s really no better way to learn from what’s already been published and there is a lot to be learned not just from the craft itself — but from books that are popular that we might not like. It’s pretty crappy of us to automatically dismiss books that aren’t our cup of tea and (in my mind) pretty stupid. We should want our stories to be read, right? I’m going to be heading up to CONvergence with John Kovalic and the rest of the Dork Tower/Dr. Blink team next weekend. Some of our MIBs for Steve Jackson Games will also be there, too! I’m on vacation beginning at 5 p.m. today, but I have a lot to do before then! I’ll post my schedule next week. My friend Bill Walton, who is also a huge advocate for the gaming industry, lost everything in a fire. You can read his post about how you can help here: family emergency. I had a mini named after me. Characters? Yeah, that’s happened before. A few times. Heh. But never a mini! Find me in the extras on Eden Studio’s Conspiracy X The Conspiracies Sourcebook on Kickstarter. For my Clarion Write-a-Thon, I added some excerpts on my writer’s profile, and I joined a writing team! Been scrambling trying to get ready for vacation so I haven’t blogged much about this or my word count. I hope to be doing that next week. I’m working on revisions for my Have Blaster, Will Travel story and will be gearing up for a new short story readers voted on for Our Last Best Hope. More on that soon! Well, that’s all the time I have right now. Phew! Mood: I have vacation on my brain. Caffeinated Beverages Consumed: GIVE ME COFFEE OR GIVE ME DEATH. In My Ears: The sound of a 1,000 blades whirring. Don’t worry, these are fans. Latest Artistic Project: A gold bead. Yep, I made a bead. And other assorted hilarity. Dear Readers, after reading a ton of books and poring through research, I have decided to up my word count. (Less thinky, more writey.) To do that, I’m going to participate in the Clarion Write-a-Thon. I’m not a Clarion attendee myself, but I know a lot who have graduated, and their experience with it sounded excellent! What’s more, is that The Clarion Science Fiction and Fantasy Workshop portion also has a support network, which is where the Write-a-Thon comes into play. I am a big fan of the idea because I feel that every writer needs a cheering section. It can be tough (speaking from personal experience) when you are new or you don’t have readers giving you feedback. 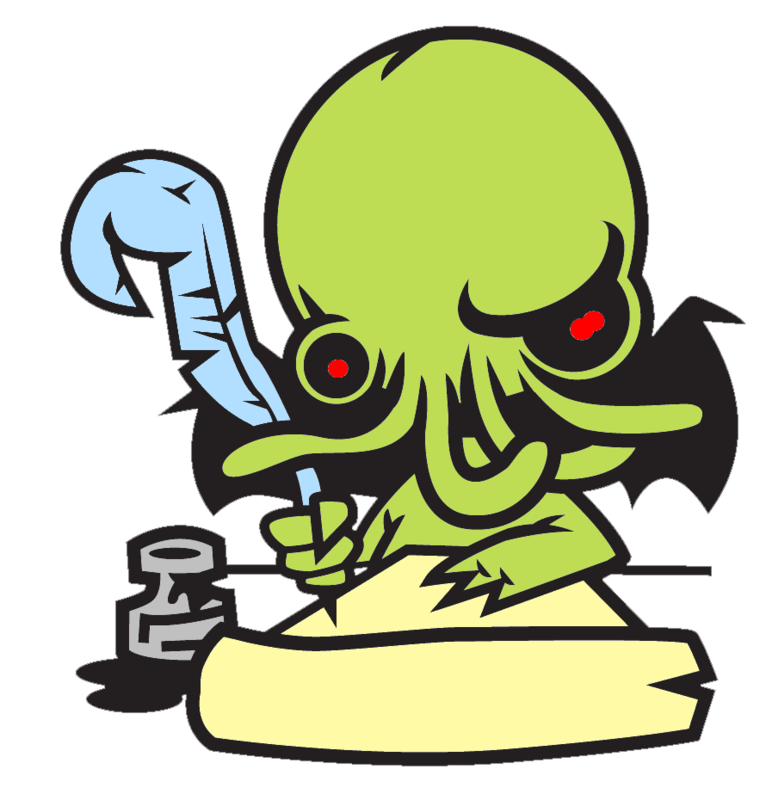 I am all over writing to help out attendees, so I’ve pledged to write 50,000 words in about a month, which is the same word count as NaNoWriMo. For me, it is about a month, because I have about a week-to-two week’s worth of travel for upcoming summer festivals and conventions. 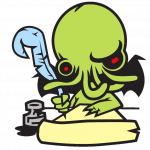 Please consider sponsoring me for the Clarion Write-a-Thon. I am writing 50,000 words and am hoping to raise $250 to support the education of other writers. Writing begins officially on June 24th and ends on August 4th, which are the same dates as the 2012 Clarion Workshop. I hope to raise $250 for the workshop. I hope you’ll consider sponsoring me on my quest to write on, write on. Thank You! Now Tell Me How The World Ends. Good morning! Well, much to my surprise I will now pen a second story for a Kickstarter stretch goal! I just handed in the first draft of the loosely-titled “Fang’s Revenge” for the Have Blaster, Will Travel anthology. Now, I get to write ANOTHER disaster story and Kickstarter backers get to shape the plot for this one, too! The Our Last Best Hope – An RPG To Save The World Kickstarter was a smashing success! Or, you can fill out the survey here in my blog. Can’t wait to read your responses! Please fill out the survey by Sunday, June 24th so I can start writing. To get another blowy uppy story in an anthology with several fine and respectable authors we need to hit the last stretch goal. Now, we have a few days to make this happen and the stretch goal is a little stretch-y. $10,000. So, instead of telling me what to blow up this time? YOU GET TO PICK THE DISASTER. That’s right, cats and kittens. We make this goal by Sunday, June 17th and you tell me how to destroy the world. Then, I will pen a short story for your reading pleasure. I kind of like this plan! Time for an update on the Have Blaster, Will Travel Bulldogs! Anthology on Kickstarter. My story is almost done, but I’m working out a few pesky plot kinks. See, Fang decided to um… He plotted to… Um… Well, there’s a lot of bang bang shoot ’em up and I got hung up in the consequences. You know, police and bounty hunters and people weeping and all that business. Oh, and ammo depletion. Did I mention the running out of munitions part? Like… A lot? And with that, I must away to the Annex (or apex) of my glorious abode to meander through a to-do list and the Day JobTM before I allow Fang to take over. And here’s some links about the story Fang first appeared in. Constructing Redwing’s Gambit: Easter Eggs – Part 5 of 5. Announcing The Lion and The Aardvark! 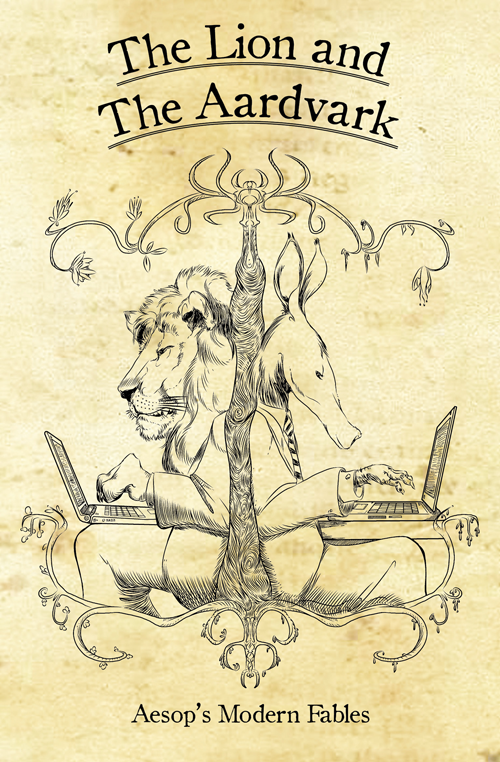 Today, I am pleased to announce a new anthology titled The Lion and The Aardvark will include a fable from yours truly titled “Bored to Fu.” The book, which is published through Stone Skin Press, will debut just in time for the holly-daze. This tome is a collection of Aesop’s Modern Fables and has been edited by Robin Laws. The cover depicted here was illustrated by Jim Zubkavich, a very talented writer and artist (among other hats he wears).